Readers flocked to DTiNews utilizing the opportunity to answer all of their questions regarding learning the English language. Well over 2,000 questions were submitted live today in a joint DTiNews/DanTri online exchange which was hugely successful and highly engaging. The abundance of people inquiring about how to improve their language skills and English studying habits flooded the websites today. The immense interest showed that studying and learning English is an important issue in Vietnam right now and one of great concern. 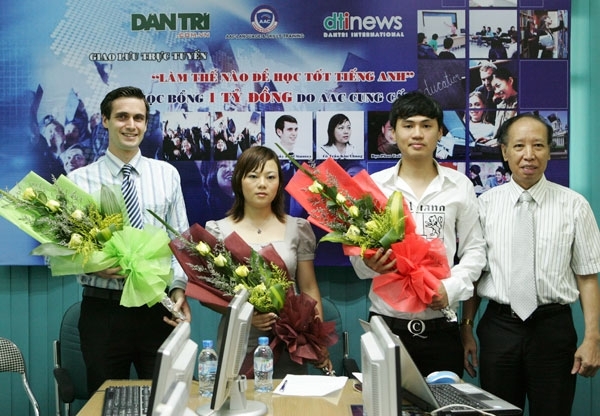 Questions were submitted and answered in both English and Vietnamese live. AAC sponsored the event and gave readers the opportunity to communicate with experienced teachers from AAC Language and Skills Training. The exchange allowed concerns to be addressed by Vietnamese learners studying english, provided tips, answers, and suggestions to improve their skills. Special guests invited to take part in the online exchange program include two AAC teachers, Mr. Paul Stanton and Ms. Tran Kim Chung, and former AAC student Phan Tuan Linh.